Police colluded with loyalists behind over a dozen murders in north Belfast, a report by the Police Ombudsman of Northern Ireland has confirmed. 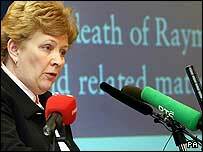 Nuala O'Loan's report said UVF members in the area committed murders and other serious crimes while working as informers for Special Branch. It said two retired assistant chief constables refused to cooperate with the investigation. 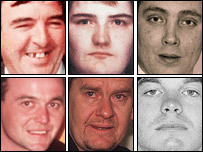 Special Branch officers gave the killers immunity, it said. The officers ensured the murderers were not caught and even "baby-sat" them during police interviews to help them avoid incriminating themselves. The Special Branch officers "created false notes" and blocked searches for UVF weapons. They also paid almost £80,000 to leading loyalist Mark Haddock, jailed for 10 years last November for an attack on a nightclub doorman. Responding to the report, Chief Constable Sir Hugh Orde offered an apology to the victims' families. He said the report made "shocking, disturbing and uncomfortable reading". NI Secretary Peter Hain said: "I am convinced that at least one prosecution will arise out of today's report." Sinn Fein president Gerry Adams said republicans would "not be surprised or shocked by the revelations". "We think that it's an incentive that the mechanisms which were put in place for accountability, which we put in place and which we have argued for, now need to be deployed, not only to make sure that this does not happen (again), but if it does, that those guilty will be dealt with properly," he said. The report, published on Monday, called for a number of murder investigations to be re-opened. But it is unlikely that any of the police officers involved will be prosecuted - the ombudsman said that evidence was deliberately destroyed to ensure there could not be prosecutions. Nuala O'Loan said investigation was a lengthy task. "What emerged during our inquiries was that all of the informants at the centre of this investigation were members of the UVF," she said. "There was no effective strategic management of these informants. As a consequence of the practices of Special Branch, the position of the UVF, particularly in north Belfast and Newtownabbey was consolidated and strengthened over the years. How could this happen?" Mrs O'Loan said former Chief Constable Sir Ronnie Flanagan was interviewed by her office, but was unable to assist the investigation. The report said: "Others, including some serving officers, gave evasive, contradictory, and on occasion farcical answers to questions. "On occasion those answers indicated either a significant failure to understand the law, or contempt for the law." The ombudsman's investigation began more than three years ago when Belfast welder Raymond McCord claimed that his son, also called Raymond, had been killed by a police informer. The former RAF man, 22, was a member of the UVF who had some involvement in drugs. 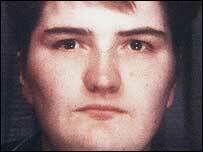 In 1997, he was beaten to death and his body dumped in a quarry. Mr McCord has said he wants those who murdered his son to be put in prison. He said he had received a death threat at the weekend from the UVF. Among the investigations which could be re-opened are the murder in north Belfast in 1992 of 27-year-old taxi driver Sharon McKenna, who was shot at the home of an elderly friend. The names of the police officers and the informers have not been made public. However, it is known that the main informer at the centre of the investigation is Mark Haddock, who was named in the Irish parliament 15 months ago as a UVF killer. Some of the Special Branch officers criticised in the report have rejected the ombudsman's allegations as "unfounded and incapable of substantiation". In a statement, the Northern Ireland Retired Police Officers' Association said they had always acted in the best interests of the pursuit of justice and had nothing to be ashamed of. The officers also challenged the ombudsman to disclose the details of any evidence of their criminal behaviour discovered during her investigation.